Our daughter Michelle turned 21 on Thursday, April 4th. Time really flies and every day I try more and more to enjoy the life given to me. I still remember that warm April Saturday! Earlier that day I was raking the boulevard, trying to get rid of all of the winter debris that was pushed from the winter plows. I was tired and just laid on the couch. Chris was in the basement changing a load of laundry and said “My water broke! Its time.” Two minutes later she began having labor pains. I was first dragging my feet and thought maybe she was over reacting; but then another labor pain followed just two minutes later. By the time we left the house it was around 3:30pm. On the drive to the hospital I was becoming nervous. The labor pains were consistent and frequent and I was not ready to deliver a baby in the car that day! I drove really fast and ushered her in the emergency room. Moments latter, the nurse had her in a wheel chair heading to the room just as fast as she could maneuver it. I think it was 5:05pm and our Michelle was born beautiful and healthy. For a birthday celebration, we were taking her out to dinner. I suggested that Michelle and her boy friend Jake to be at our house by 4:00pm for happy hour. I wanted to have a glass of wine before leaving and had grabbed a bottle of Gary’s 2004 Smith Wooton Cabernet Franc from Gallagher’s Vineyard. I was a bit hungry Chris assembled a small cheese and cracker plate. I pulled the cork and rated the wine before the kids arrived. The kids arrived promptly at 4:00pm along with their friends Jenna and Brandon. I offered them each a glass of wine, but only Jake had a glass while the girls and Brandon declined. Apparently, Brandon had “too much fun” the night before at Michelle’s original birthday outing and was still feeling green. 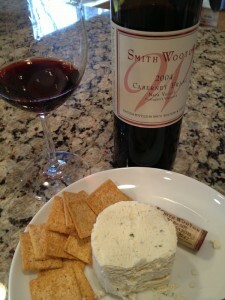 The Cabernet Franc paired really well with the Wheat Thins and soft Garlic cheese spread. Medium color depth with a nice ruby to garnet hue. The meniscus is showing some age. Very aromatic and still has a fruity nose. Some of the aromas where Oak, caramel, ripe red fruit and green pepper. There were some slight floral hints too. Velvety, smooth, and flavorful. The Cabernet Franc was not dry at all. It was medium to full bodied. The acidity was good. I noted tannins but they were soft. We could taste dark ripe fruit, spice and earthy. The finish was long but enjoyable. How much? It was part of a past wine club shipment and I think it was around $35.00. 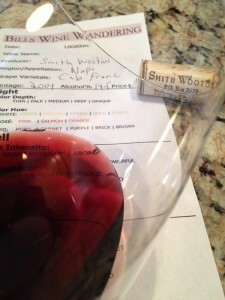 As the Cabernet Franc sat open, it became even more enjoyable. I left the bottle open on the counter while we were out eating and I am sure glad I had. Even an hour after we returned it was great. Once I finished the last drop, I was left wanting more! 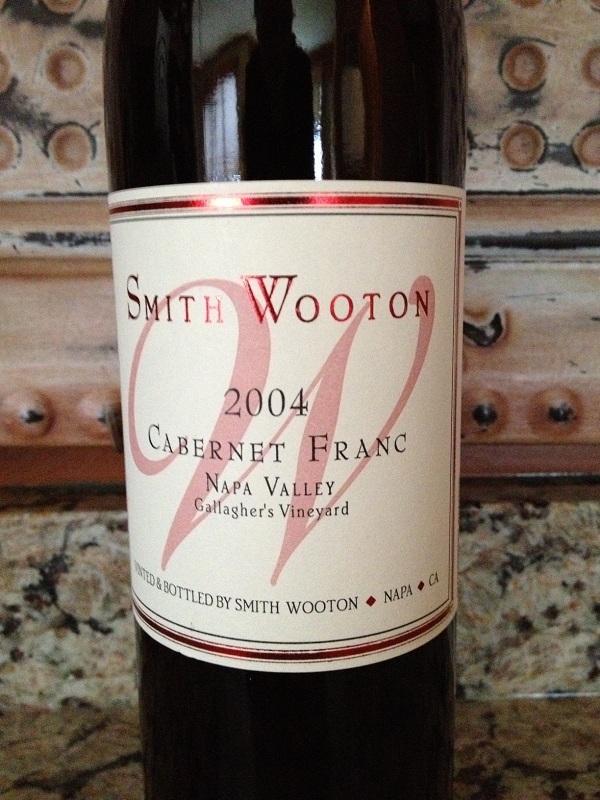 I rated the 2004 Smith Wooton Cabernet Franc four glasses.